Opening Tuesday July 18th in Manhattan’s East Village is Old Monk, specializing in Contemporary Indian Soul Food. Named for the iconic Indian dark rum brand, Old Monk’s rule-breaking menu is poised to redefine Indian fare while still honoring the rich and vibrant flavors of the country’s diverse regions. Old Monk is the newest concept from pioneering restaurateur and culinary mogul Sushil Malhotra, in partnership with Executive Chef/Co-owner Navjot Arora. Malhotra first introduced New Yorkers to high-end, stylish Indian restaurants with Akbar and Dawat. More recently, he has made Indian food mainstream via Café Spice, his national retail brand of prepared Indian meals, as well as Café Spice Restaurant Group, with three award-winning restaurants in Westchester, NY. Arora serves as chef/partner at two of these, the acclaimedChutney Masala and Sambal. A twist on traditional Indian food, menu highlights at Old Monk include house-baked Goat Cheese Naan with pumpkin and melon seeds;Wild Rice Jhaal Moori with wasabi peas, tamarind and mint; Anjeer Kofta – tender fig and paneer dumplings in a saffron sauce; andTellicherry Pepper Beef featuring flank steak, peppercorn jus and curry leaves. 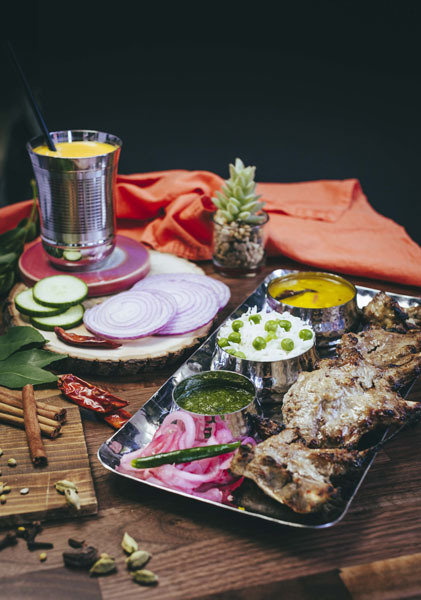 Old Monk Rum Lamb Chops are marinated in the iconic Indian dark rum and grilled on the tandoor. Adding to the convivial vibe, a special section on the menu, “You’re in Good Hands,” features a family-style, four-course feast. Seasonal ingredients are carefully sourced from NYC’s greenmarkets and spices are ground in-house. Beer and wine license to come; the restaurant’s planned beverage program will include an extensive craft beer selection and a global wine list by Consulting Sommelier Kristie Petrullo–Campbell (ex-Eleven Madison Park, Jean Georges, Craft), who will also work with Chef Arora to develop unexpected pairings to complement his dishes’ array of colorful spices and seasonings. To ensure Old Monk’s design is as bold as the food, Malhotra and Arora brought on Junoon designer Tarik Currimbhoy (Currimbhoy & Co.) The 55-seat restaurant feels right at home in the once-gritty, still-trendy Alphabet City, complete with vibrant photographs depicting monks in the modern world, talking on cell phones and snapping photos. Traditional colored scarves with Sanskrit script hang from the walls and the bar alcove is painted in saffron hues of a monk’s robe. The front bar, decked in polished copper, is dotted with four champagne cork bar stools. Additional décor features such as dark walnut liquor barrels (a nod to the restaurant’s namesake), walnut table tops, filament bulbs hung from the stamped copper metal ceiling and antique mirrors add to the restaurant’s warmth, yet still match the contemporary neighborhood ambiance.